OK so technically winter isn’t really over, but we have quite a few families that have sought warmth in vacations this week…Good for YOU!!! I am working on a batch of Kombucha candy made with our own Maple sugar from our trees here at the farm. Paneer is a favorite here too and we are making it this week! Our kids are beginning to be weaned, and we are milking six does every morning. We have the babies in with their moms all day, and at night they go to the nursery until the next morning. So far we have made yogurt, neufchatel, and now paneer. I am so excited to make feta again, it’s my personal favorite! Steph, our farm apprentice is making goat’s milk lotion that is absolutely divine! The bottles are 12 oz. and cost $10.00 per bottle. All proceeds go to Steph to give her some spending money while she works and stays here this summer. Right now she has Vanilla Lavender scented lotion, and she is toiling away in the lab to create some fresh new fragrances. Tomorrow is our Organic Certification Inspection, We have been preparing our records to show each step of the way on our products from seeds to sale…Wish us luck, I hope all goes smoothly. Great fun next week as we will be having our Advisory Committee Meeting on Tuesday, a farm mentoring workshop on Wednesday and our seed starting class, seed swap and open house on Saturday. 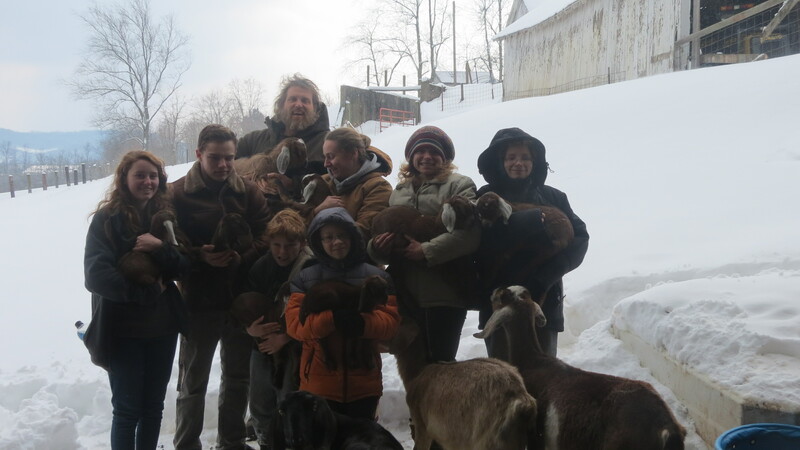 Whew, it really isn’t spring just yet, but we are certainly winding up to it farm style! Hi Dawn. I am out of town in Seattle for the next meeting. Please email notes to me. Thanks.